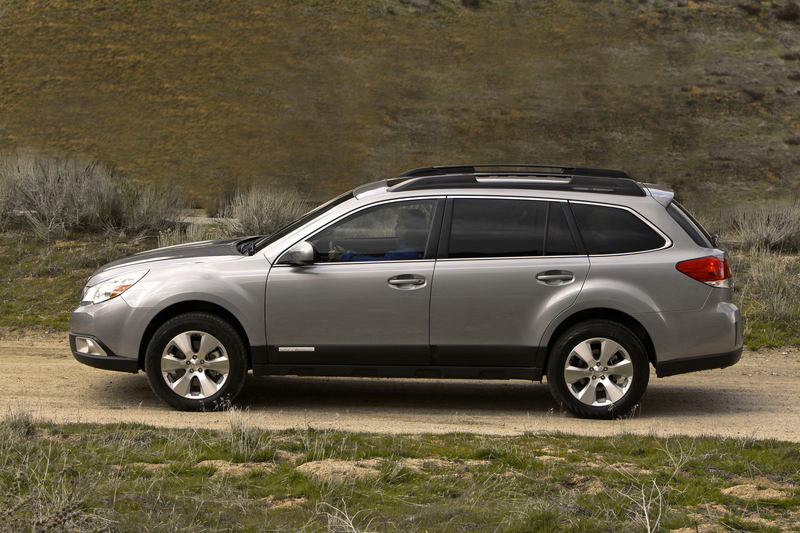 Roomy and sure-footed, the 2013 Subaru Outback has a strong niche following — but is it the right crossover for mainstream buyers, too? But why are lesbians attracted to Subarus? This is something I’ve been trying to figure out for years. Here’s the best theory I’ve come up with: Men (of which I am one) are a huge pain in the neck. We buy the most useless stuff, we’re stubborn, we have that whole testosterone-fueled bravado thing going on, and we grow hair in and on the most unbecoming places. Women are infinitely better — softer, smarter, and more sensible. Taken as a group, the biggest flaw women seem to have is that the majority of them are attracted to guys like me. Gay women — now they have the right idea. And I think that’s why they are so fond of the Subaru Outback. Compared to the average SUV, the Outback really is softer, smarter and more sensible. It does all the stuff we want our SUVs to do — haul lots of gear, and keep going when the weather turns nasty — without any of the bad habits or unsightly hair of traditional SUVs. This nicely explains their popularity among lesbians: These wonderful women are simply exercising their superior taste. True or not, that’s my theory and I’m sticking to it. The Subaru Outback is basically a station wagon on steroids — in fact, it’s essentially a butched-up version of the Subaru Legacy wagon (recently discontinued in the States, since the 2013 Subaru Outback has proven more popular). 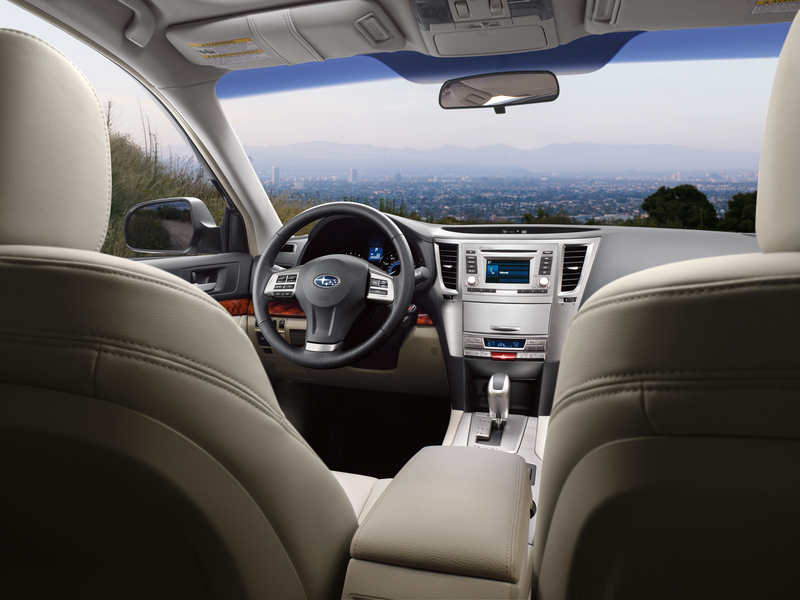 The Subaru Outback is built like a car and offers great back-seat room with excellent in-and-out access. But it sits higher than typical wagons so it’s easier to get little kidlets in and out of their car seats, and there’s plenty of legroom as they grow into teenagers. 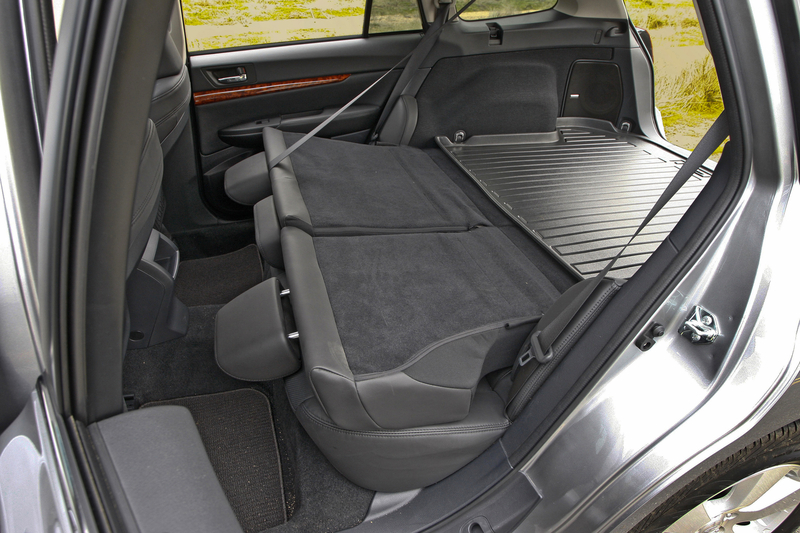 The 2013 Subaru Outback offers 41.1 cubic feet of cargo space behind the back seats, which is nearly as much as big SUVs like the Honda Pilot and Ford Explorer. 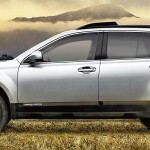 Because the Outback is a station wagon, its cargo space is oriented horizontally rather than vertically, so things like jogging strollers and mountain bikes are easier to stuff in, while convenient grocery-bag hooks help with life’s more mundane chores. Subaru knows what kind of things its owners get up to no, not that — get your mind out of the gutter, girl! 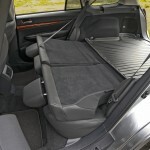 ), so all Subaru Outbacks get a big rubberized tray that protects the cargo floor. The walls are lined with thick, hard-wearing carpets, although the plastic trim just below the windows on my brand new test car was already showing some scratches and scuffs. 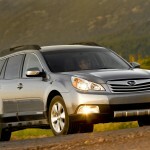 The Outback has just the standard six airbags (many manufacturers are now installing up to 10 airbags! ), antilock brakes and electronic stability control. But don’t overlook its agile handling and outstanding bad-weather grip (which we’ll talk more about shortly) — if you have to swerve to avoid a collision, the Subaru Outback will respond more crisply than a big SUV, and is less likely to lose traction on slippery roads. If you do crash, you’ll be pleased to know that the Outback aced all of the Insurance Institute for Highway Safety’s crash tests, earning their coveted Top Safety Pick award, although it only scored four out of five stars in the government’s crash tests. 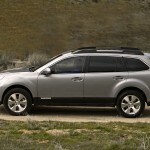 The 2013 Subaru Outback is offered with two engines, a 170 horsepower 2.5 liter 4-cylinder and a 256 horsepower 3.6 liter 6-cylinder. Both are “boxer” type engines, a layout favored by Subaru, Porsche, and the old Volkswagen Beetle; aside from giving you one more topic to add to your small-talk repertoire, this has little real-world significance, although the layout does help lower the Legacy’s center of gravity (which aids handling) and gives the engine a unique “chugging” sound (which aids nothing). My test car had the 4-cylinder engine and a continuously-variable automatic transmission; it’s adequately powerful, if a bit noisy. The 4-cylinder is also available with a 5-speed stick-shift, which has a nifty “hill holder” that prevents you from rolling backwards on steep inclines. 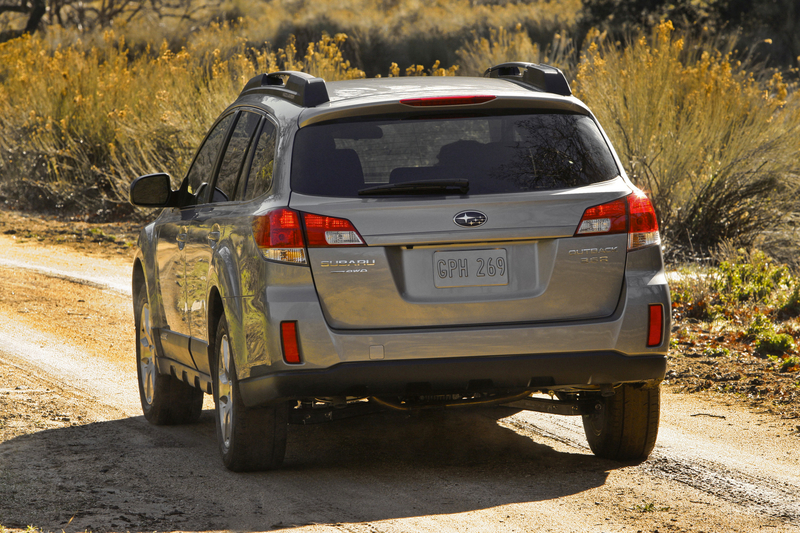 EPA fuel economy estimates for the 4-cylinder automatic are 22 MPG city/29 MPG highway, and with a big 18.5 gallon fuel tank, the Outback is great for long trips. All Outbacks come with a sophisticated all-wheel-drive (AWD) system (though automatics get an even more sophisticated system than stick-shifts, and six-cylinder cars get Subaru’s best). They sense which wheels have the most grip and divide the engine’s power accordingly. That, combined with the Outback’s high ground clearance, make the Subaru Outback nearly unstoppable in the snow and much more sure-footed than most cars in the rain. That explains the appeal to New Englanders. Perhaps lesbians appreciate that the AWD system improves the handling on dry roads; unlike most SUVs, the Outback can be pushed through the corners almost like a sports car. 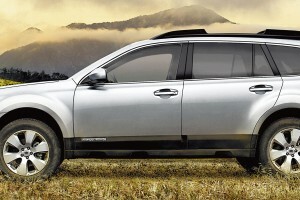 Most of the Outback’s electronic wizardry is found in its all-wheel-drive system. Other than that, the Outback has few optional gizmos: Rear-view camera, Hardon-Kardon stereo systems, and GPS navigation. The Subaru Outback lacks family-friendly nice-to-haves like a power tailgate or rear-seat DVD player, and Bluetooth phone connectivity is not available on the base model. Pricing starts at $24,070 for the basic 2.5i model, which comes with cloth seats, air conditioning, and a manual transmission; automatics are $1,000 higher. That's pretty good value for an all-wheel-drive car, but Outbacks with options get very pricey. A mid-level 2.5 Premium with an automatic transmission goes for $26,570, which is still rational, but my test car, a leather-lined 2.5 Limited with heated seats, a sunroof and navigation, listed for $32,465. A top-of-the-line six-cylinder 3.6R Limited can be optioned to over $35,000 -- yowch! I'll close with one other tidbit of Outback trivia: Subaru owners tend to keep their cars forever, and they are intensely loyal to the brand. (Okay, two tidbits of information.) Visit a Subaru dealer's used car lot, and it's a safe bet that most of the Outbacks you see will have 150,000 miles or more on them, and that their owners traded them in for another Subaru. Clearly, these people are on to something -- in the Outback, they feel they have found a better alternative to the mainstream. Just like lesbians. And New Englanders. Mr. Gold, you are underestimating your target audience. 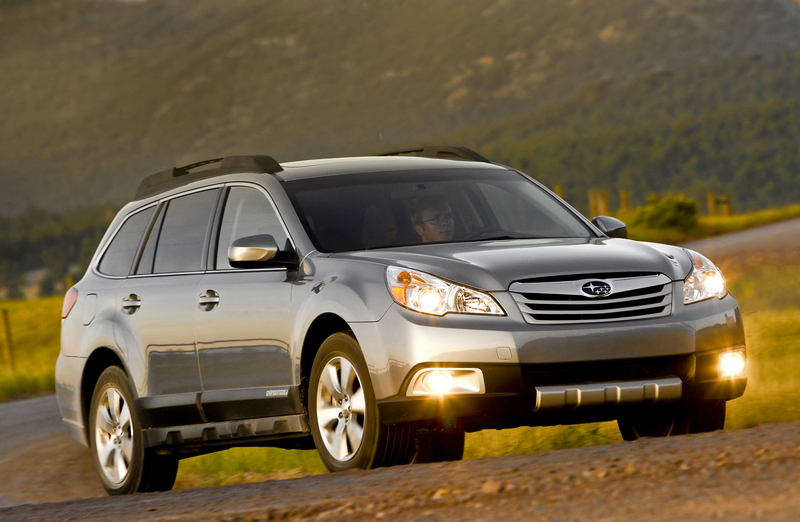 Did you bother to test drive a 2013 Outback? After having read this article, I doubt it. 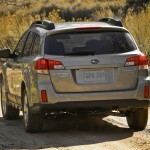 The symmetrical AWD is mechanically the same across the whole Subaru lineup. As for tech, how about the optional Eyesight Driver Assist system that features collision avoidance, lane departure and sway warning, along with adaptive cruise control. No mention of the popular all weather option that includes heated wipers ,outside mirrors and seats. Dvd players are a dealer installed option. How do I know these facts? I’m looking to buy a SUV or Crossover for my wife and am researching and test driving cars from Acuras to Volkswagens. Save your personal homophobic opinions for your friends, nobody cares about ignorant stereotyping anymore. Subaru Outback and the new Forester are on this Grandpa’s short list because of Subaru’s good reputation for safety and reliability, which are valuable to the women I know. This article was amusing, why all the vitriol? Plus its true Subarus are popular with lesbians. Since when is being a New Englander a stereotype. The author said nothing offense about lesbians, in fact he was vaguely complimentary. I wish there were more cars like the Subaru. I wish it had better gas mileage(I don’t need a 4 wheel drive). But when my minivan bites the dust I will probably get a Subaru PZEV. Windows you can see out of. Space and fold down seats. Not a lesbian, or New Englander. I just want a car that is practical. I made a purchase of a OB 2014, 2.5I Premium for $3,800 off MSRP. Could have bought any car under $38K but choose the OB premium for the value price and how it met my needs. I’m in the sixth decade and wanted the raised seating height without the bloat crossover type vehicles exhibit. 30 + mpg was a requirement. After 2,000 miles I’ve grown more fond of the OB. The fit and finish is flawless. The interior materials while not lux are also not cheap looking. Radio much better than my previous 07 Honda Accord Hybrid. The OB’s tall wagon shape more interesting than Honda’s CRV. The OB is quiet for its class and rides well. 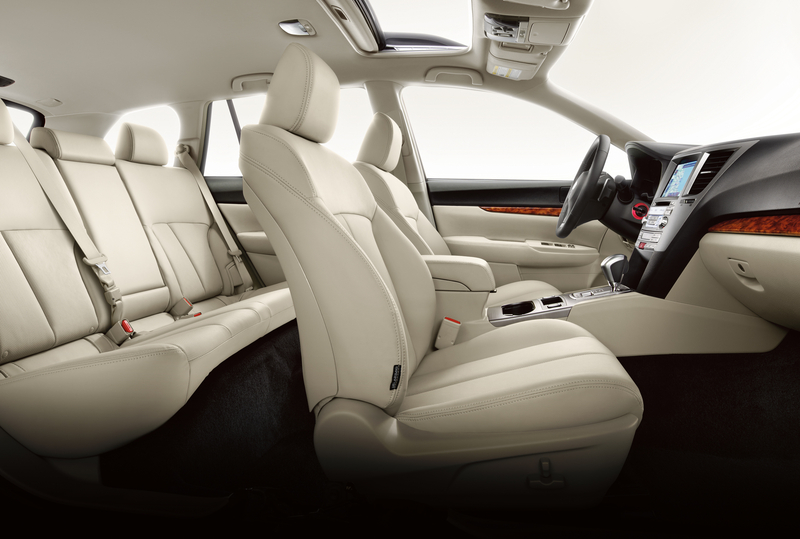 The ivory interior compliments the outside colors and gives the car an upscale look. The CVT transmission on the 2014 OB improved over the 2013 OB. Gone is the tendency to zoom while accelerating. The OB image is more youth oriented but it is a great option for older folks regardless of gender or sexual preference.